What this means is that the outright replacement of enamel is now plausible and in fact outright likely. While we wait for someone to figure out how to regenerate fresh teeth, this will do nicely for most everyone. If we can also figure out how to prevent abscesses and the death of nerves, then teeth preservation will become the norm into serious old age as wear itself becomes completely repairable. For my generation who have lived with an ongoing struggle to preserve our teeth after our parent's generation generally gave it up quite early and switched to false teeth this may even be in time to help extend it all some more. I suspect though that we are about ten to twenty years out to when fresh teeth will be simply regrown and perhaps capped with titanium mesh. 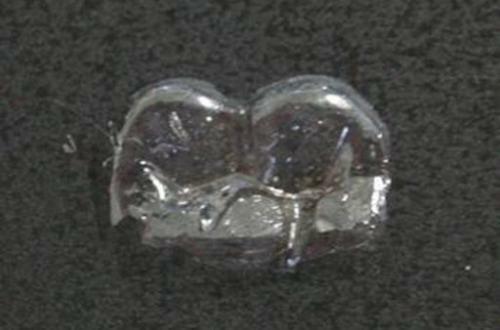 Handout picture released from Japan's Kinki University professor Shigeki Hontsu shows a tooth-patch, an ultra thin biocompatible film made from hydroxyapatitte. These particles fall onto a block of salt which is heated to crystallise them, before the salt stand is dissolved in water. The film is scooped up onto filter paper and dried, after which it is robust enough to be picked up by a pair of tweezers. "The moment you put it on a tooth surface, it becomes invisible. You can barely see it if you examine it under a light," Hontsu told AFP by telephone. The sheet has a number of minute holes that allow liquid and air to escape from underneath to prevent their forming bubbles when it is applied onto a tooth. One problem is that it takes almost one day for the film to adhere firmly to the tooth's surface, said Hontsu. The film is currently transparent but it is possible to make it white for use in cosmetic dentistry. Researchers are experimenting on disused human teeth at the moment but the team will soon move to tests with animals, Hontsu said, adding he was also trying it on his own teeth. Five years or more would be needed before the film could be used in practical dental treatment such as covering exposed dentin—the sensitive layer underneath enamel—but it could be used cosmetically within three years, Hontsu said. Sea Ice Smashes Record By 500,000 Sq Kms. Canada / Iran - Why Now? Swamp Ape or Swamp Sloth?